To conduct business today, you must routinely share digital files containing sensitive data with an extended network of collaborators. Such data may involve your intellectual property, business plans, employees, customers, partners, and even your financials. Sharing this type of information without any protection is an invitation for disaster. If it were to fall into the wrong hands or used unethically, this information could cause serious damage to your business. AutoShred - Doc is a simple-but-powerful application that allows you to share MS Word files and impose automatic shred dates. AutoShred Doc also encrypts the files for safe online transmission. You can use AutoShred - Doc interface from a desktop icon, the Start menu, and from Outlook and Lotusif you wish to create a secure file and include it as an email attachment. With AutoShred - Doc you dictate the date when a shared file automatically self-destructs. In addition, AutoShred - Doc always blocks the recipient’ s ability to cut-and-paste, drag-and-drop, and perform screen captures. To view content secured by AutoShred Doc, a recipient uses Pinion Receiver. 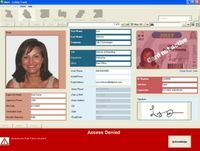 Pinion Receiver is a FREE client application that lets recipients view and work with secured files, controls access to the files, enforces assigned permissions, and removes the files upon the expiration date. 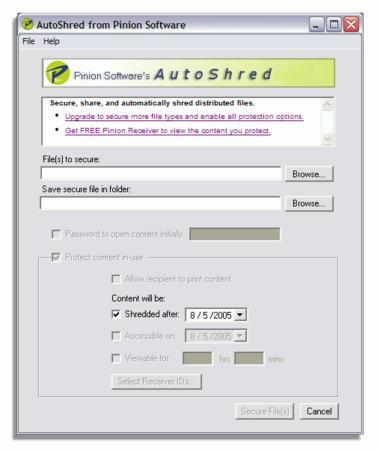 Pinion Receiver allows recipients to view and work with files that are secured with any Pinion Software product (AutoShred - Doc, AutoShred PDF, Pinion Desktop Packager, SecureMail, SecureCD, or SecureShare). When used from Outlook or Notes, AutoShred Doc inserts a link for your recipients to obtain the free Pinion Receiver. If used, in stand-alone mode, you must direct your recipients to www.pinionsoftware.com so that they can get the free Pinion Receiver.